The haze in Singapore may have reached record high levels in the last two years, but Uber seems to be stepping up to the challenge. 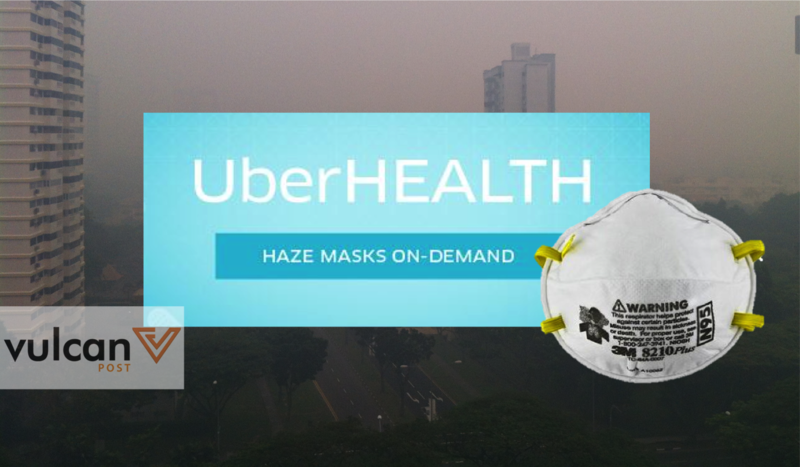 In a mailer sent out yesterday in the late afternoon, the private car service announced their UberHealth campaign, where they promised to send a free package of 4 N95 masks and some accompanying Uber swag to those who called for it. This service ran until 7pm. Despite the short time-frame, many jumped at the opportunity to connect with the hundreds of drivers islandwide that were equipped with masks. As expected, Uber quickly dispensed all their masks, but not without leaving quite a few people satisfied with the quick delivery. 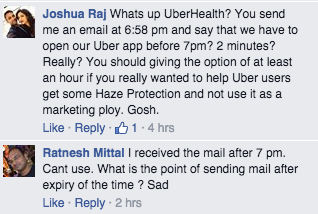 However, there were a few angry users who also shared on Uber’s Facebook page that the email was sent way too late; some even said that they received the email after the cut-off time of 7pm. While there were users who were disappointed when Uber’s stock of N95 masks ran out, it was a far cry from the fiasco that was their food delivery attempt in Singapore and Malaysia, which left many users hungry and frustrated. The unmitigated popularity of their food delivery campaign, in partnership with local startup Grain, invoked the ire of many Singaporeans who took to social media to voice their unhappiness with the transportation company. Despite the failure of their previous marketing scheme, Uber is undeterred in their attempt at being the transportation choice of Singaporeans, having delivered smartphones, ice cream, and now protective masks. Perhaps it was their better management of demand this time round that saved them, but it’s clear that Uber may win back Singaporeans’ forgiveness yet. Uber Spoils Us With Healthy Dinner Delivery This Thursday — For Free!